Merkel’s astonishing U-TURN goes on as she launches a war on migrants. 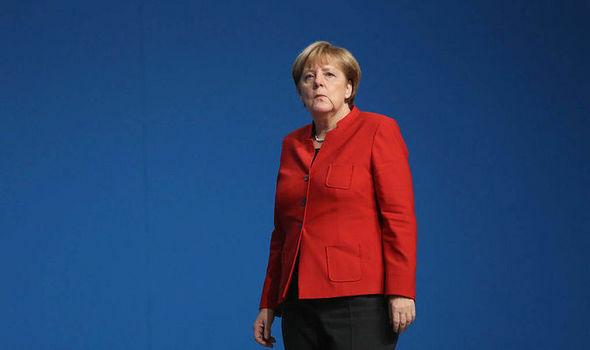 Delegates at Mrs Merkel’s Christian Democratic Union party conference in Essen, west Germany today and slammed migrants engaging in illegal activity citing forced marriage and honour killings as major problems. The address comes after the chancellor confirmed she will seek a fourth term in office amid heavy criticism over her open door borders policy. Now her party has adopted a slogan “Our values. Our future” after debating a resolution on tackling forced marriage and honour killings in the country. Yesterday during an address Mrs Merkel called for a ban on full-face Muslim veils “wherever legally possible”. Today the party debated on the issue of: “Forced marriage and honour killings” insisting they “must be prevented and prosecuted rigorously,” indicating for the first time that there has been a rise in criminal activity. The interior and justice ministries could not immediately give figures on any forced marriages or honour killings among the record 890,000 people from the Middle East, Africa and elsewhere who arrived in Germany last year. Italian government smuggle illegal immigrants from Africa into the EU?